HELP US CELEBRATE INDEPENDENT BOOKSTORE DAY!!!!!! Time for Origami at Francie & Finch! 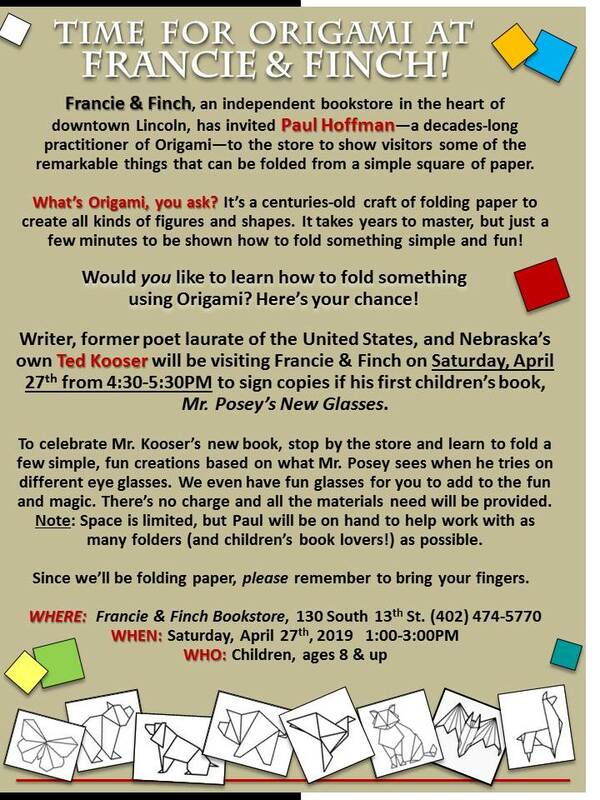 Paul Hoffman – a decades-long practitioner of Origami will be at the store to show visitors some of the remarkable things that can be folded from a simple square of paper. What is Origami, you ask? It’s a centureis-old craft of folding paper to create all kinds of figures and shapes. It takes years to master, but just a few minutes to be shown how to fold something simple and fun! Would you like to learn how to fold something using Origami? Here’s your chance! To celebrate Ted Kooser’s new children’s book, Mr. Posey’s New Glasses, kids will be able to learn some fun creations based on what Mr. Posey sees when he tries on his different eye glasses. Recommended for children , ages 8 & up. All materials included and kids will go home with their own pair of Mr. Posey’s New Glasses! P.S. Ted Kooser will be at the store later in the day – let us know if you’d like an autographed copy of his new book.